I just noticed for the first time that there's a comment directly above the review box which asks, "what did you think? "Here's what I thought : Four! Four! Four! Four!It's a short story. But man...is this a goodie. I hearts teh Four. That's my official stance.Did I waste 99 cents on a 14 page story? Maybe I did (because really, this should have been a freebie for as short as it is), but his PoV made my night. I didn't realize he had a witty side hiding under all of that seriousness in book 1. I wouldn't complain if we got to be in his head more often. 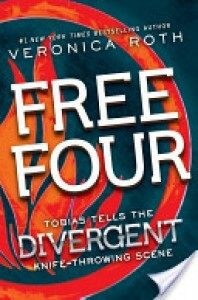 This short story covers the knife throwing scene - the one in which Four nicks Tris' ear on purpose. It's not a long enough story to really be a massive spoiler if you haven't read the first book, but it sure isn't going to be as enjoyable to read if you haven't read Divergent because you're being plopped down into a scene which takes place pretty far into the book.She tips her chin up and looks at me with that Abnegation stubbornness I know so well. She may have left them, but they are what's making her strong.I can't tell her that it will be okay, not with Eric here, but I can try to make her strong.~Looking at her is like waking up.~The other factions call us brutish, as if we don't use our minds, but that is all I do here.